An Italian politician and statesmen, who served as Minister of Industry, Prime Minister of Italy and the 10th President of the European Commission. 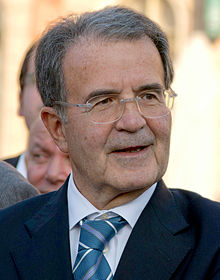 Romano Prodi holds a Law Degree from the Catholic University of Milan and advanced degrees in Industrial Economics from the universities of Milan, Bologna, and the London School of Economics. He served as Italian Minister of Industry and as Chairman of the Institute for Industrial Reconstruction (IRI), at the time Italy's largest holding company. Under his chairmanship, IRI underwent far-reaching reorganisation, embarking on a process of change and preparing its subsidiaries for privatization. In February 1995, he founded the Ulivo centre-left coalition, which appointed him as its candidate for Prime Minister in the 1996 elections. Ulivo won the general elections and his Government remained in office from 1996 to 1998. One of its achievements was to secure Italy's place among the first countries to adopt the euro. In 1999 he was appointed President of the European Commission by the European Council, a position that he held until 2004. Shortly before the end of his term as President of the European Commission, he returned to national Italian politics and successfully led his centre-left coalition to the electoral campaign that eventually won by a very narrow margin. Romano Prodi was later named Head of a joint AU-UN panel aimed at enhancing peacekeeping operations in Africa. He has been Visiting Professor at Harvard University and Stanford Research Institute. His academic career began at the Department of Economics and at the Faculty of Political Science of the University of Bologna, where he worked as an assistant professor, associate professor and professor of industrial organisation and industrial policy.